Sculpted by Gentle Giant Studios! NOT in perfect condition. Deluxe display colonnade pedestal base. Secret Avengers Assemble! Have a Blast with the outlaw leader of the renegade Avengers in the Marvel Cinematic Universe. Infinity War will have you looking behind subways for his heroic arrival! Sculpted by Gentle Giant Studios! Trending at C $41.55eBay determines this price through a machine-learned model of the product's sale prices within the last 90 days. A Diamond Select Toys release! how big is your gallery?. 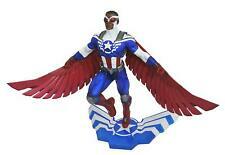 depicting the star-spangled Avenger in his Marvel now! outfit, this PVC diorama of Steve Rogers shows him charging an opponent (or an army of them) as bullets ricochet off of his vibranium shield. All Minimates are new from with no broken parts. Any issues will be noted below this line in. Buy More/Save More. Minimates Marvel 2011 FRONTLINE CAPTAIN AMERICA & BUCKY NEW SEALED AWESOME 2PK. A Diamond Select Toys release! Sculpted by Gentle Giant Studios! Sculpted by Gentle Giant Studios. Our PRE-ORDER policy: Release dates are set by manufacturer and subject to change by manufacturer. 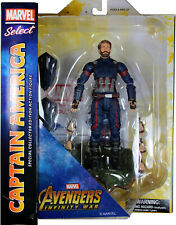 Diamond Select CAPTAIN AMERICA Action Figure 2011 MARVEL SELECT 7"
An exceptional addition to your growing gathering! He's an exceptional addition to your growing gathering of super superheroes! 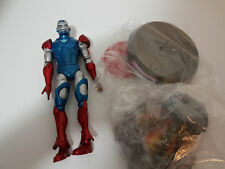 Marvel Select CAPTAIN AMERICA Figure CLASSIC LIBERTY Avengers Disney Store RARE. Condition is New. Shipped with USPS Priority Mail. The bubble is still firmly secured to the card. Overall this piece is in very good condition with great color and graphics on the card. Displays well and is a great addition to any collection. A Diamond Select Release! Art Asylum Designs & Sculpts! A Diamond Select Release! Sculpted by Gentle Giant Studios! These are original 2011 release, not the re-issue. 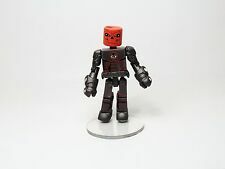 MARVEL SELECT 1ST AVENGER RED SKULL AF. DIAMOND SELECT TOYS LLC. WE WILL ALWAYS GET BACK TO YOU AS QUICK AS WE CAN. A Diamond Select Release! Sculpted by Gentle Giant Studios! These are original 2011 release, not the re-issue. DIAMOND SELECT TOYS LLC. Sculpted by Gentle Giant Studios! We will do our best to update the status of your order. We cannot cancel your order once it has been placed. • We do not accept P.O. Boxes. All Minimates are new from with no broken parts. Any issues will be noted below this line in. Sculpted by Gentle Giant Studios! Box May Contain Minor Creasing/Wear. At The Nile, if you're looking for it, we've got it. This way we know that you have received your item. Bendigo Bank. Account Number: 148404890. BSB: 633000.